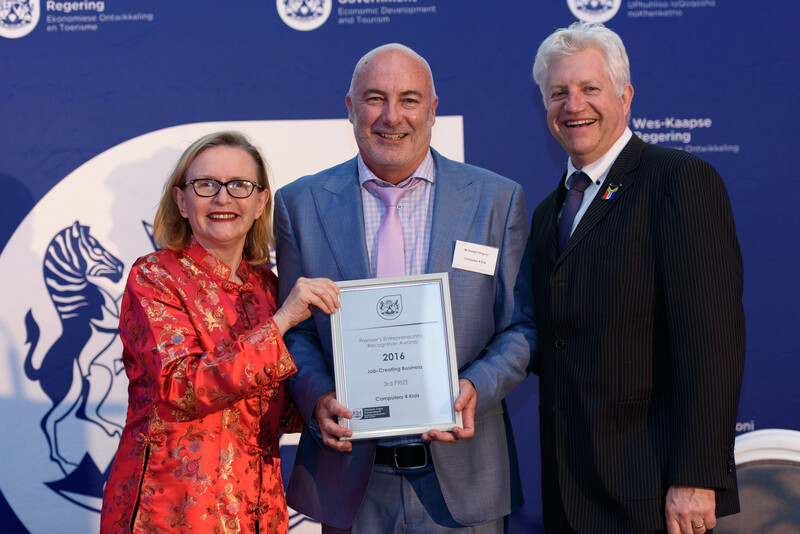 Computers 4 Kids was placed third in the ‘Job Creation’ category at the Premier’s Entrepreneurship Recognition Awards (PERA) at a gala event hosted by the Premier and Minister Winde on 23 November 2016. This recognition was based on the Internet Champion programme that Computers 4 Kids is rolling out as part of the Western Cape’s Broadband initiative. And then, on 6 December2016, the company won the SMME of the year award at the South African Premier Business Awards gala event in Gauteng. Once again the Internet Champion programme was key to the company being awarded this prestigious accolade by Dr Rob Davies, the Minister of Trade and Industry. Well done folks … we’re proud of you!